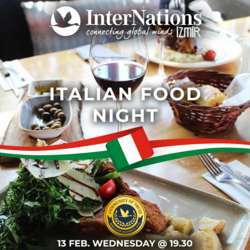 You must be a member of the Izmir DinnerNations Group to attend this activity. Would you like to join this group? This Italian Restaurant is İzmir's unique and Ethnic Italian Restaurant. All food, especially dinner, is based on a great sample of Italian cuisine. Italian food is more than just pizza and spaghetti. Italian cuisine is deeply influenced by its geographic position especially the plentiful supply of fresh seafood from the Mediterranean Sea. While you can sample Italian cuisine all over the world nowadays, it is worthwhile understanding what makes Italian food so popular the world over. If you are not familiar with the dishes in Italian cuisine, this dinner will help you get acquainted with some of the more popular dishes. Across of our may official event place. Not more than 50 meters. From outside it's quite an unassuming restaurant, looking like any other smart Italian restaurant. However when you check the menu you quickly spot the signs pointing Italia. This restaurant keeps the prices low and makes this an affordable destination for an authentic taste of one of Italiy’s tastiest regions. We will write Menu ingredients to here on following days. We waiting everyone for this delicious dinner.